Supercar or not, seeing an accident is never nice! And seeing a Ferrari F430 Spider transformed into a pile of iron hurts most car enthusiasts. This accident happened on the the Dutch highway, the A58 the other days. Driver was driving reckless and his Ferrari flipped over. Next to him was a three-years old child, and both were tossed out. At first it didn’t look good for both of the victims, but after a few hospital checks they seemed to be pretty lucky. No one else was involved in the accident. 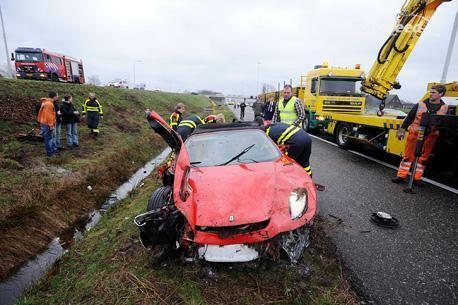 Of course we are sorry about the F430 Spider, but thanks God both driver and passenger are ok!